​​Learning to ride a bike is a childhood rite of passage. Whether at age four or fourteen, making the first trip down the block on their own is a special event for a child. But they aren’t likely to get there by themselves; you’re going to need to help them along. 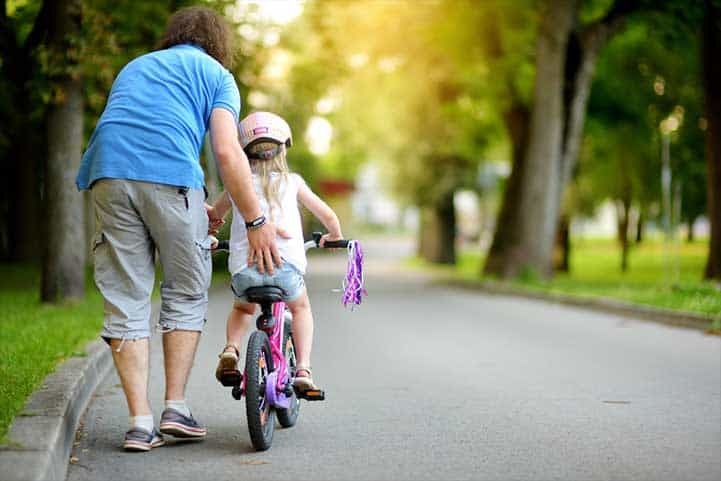 ​Teaching a child to ride a bike is a parenthood rite of passage. It’s not likely something you’ve done before, but it’s a great way to bond with your child, get them interested in a fantastic hobby, and take on a new challenge. To help you out, we’ve put together this guide to teaching your child to ride a bike. Let’s start with the basics. Learning to ride a bike is a childhood rite of passage. Whether at age four or fourteen, making the first trip down the block on their own is a special event for a child. But they aren’t likely to get there by themselves; you’re going to need to help them along. Likewise, teaching a child to ride a bike is a parenthood rite of passage. It’s not likely something you’ve done before, but it’s a great way to bond with your child, get them interested in a fantastic hobby, and take on a new challenge. ​If you aren’t a cycling enthusiast yourself, you might be wondering if it’s even worth teaching your kids to ride. Why go through the inevitable frustration? It’s a healthy, active hobby. Kids need physically demanding activities they can take part in on a regular basis. It provides both cardiovascular and muscular exercise, which is good for developing a strong heart, lungs, and muscles. 1. It’s a healthy, active hobby. Kids need physically demanding activities they can take part in on a regular basis. It provides both cardiovascular and muscular exercise, which is good for developing a strong heart, lungs, and muscles. ​It instills a sense of confidence. Learning to ride a bike isn’t easy, but triumphing over that challenge helps show kids that they can accomplish things they set their mind to. It shows children that when they work at a challenge, they can overcome it. 2. It instills a sense of confidence. Learning to ride a bike isn’t easy, but triumphing over that challenge helps show kids that they can accomplish things they set their mind to. It shows children that when they work at a challenge, they can overcome it. ​It helps develop balance, coordination, and other skills. Riding a bike requires that kids work on their motor skills, and improving those skills will stay with your child for the rest of his or her life. 4. It helps develop balance, coordination, and other skills. Riding a bike requires that kids work on their motor skills, and improving those skills will stay with your child for the rest of his or her life. ​It’s fun. Above all else, riding a bike is a lot of fun. And that’s worth doing! 5. It’s fun. Above all else, riding a bike is a lot of fun. And that’s worth doing! If you aren’t a cycling enthusiast yourself, you might be wondering if it’s even worth teaching your kids to ride. Why go through the inevitable frustration? While there’s no specific age, there are a few guidelines to follow. Most kids are ready to learn to ride around five years of age.But that doesn’t mean five years will be the right age for your child. Some kids can ride when they’re four. Other wait until they’re six. Motor development. Your child needs to be able to walk steadily and have good control over their body. 1. Motor development. Your child needs to be able to walk steadily and have good control over their body. ​Balance. While teaching your kid to ride a bike will help improve their balance, they also need some balance skills to begin with. 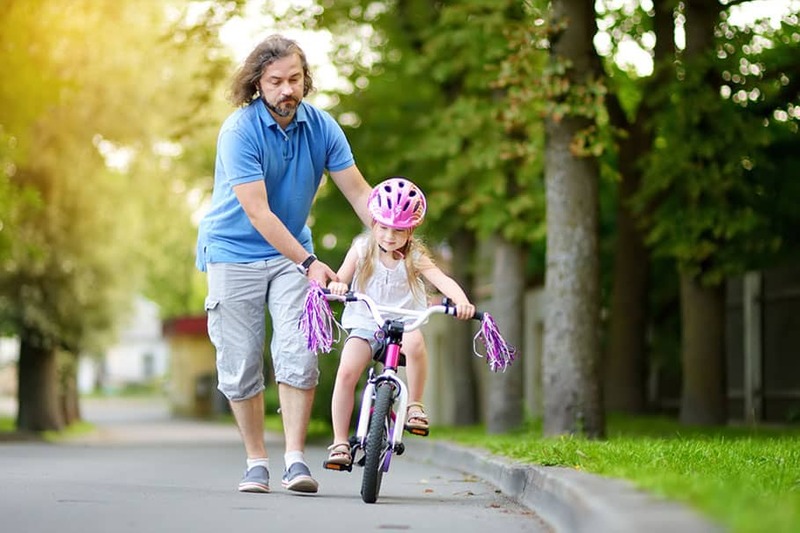 If your child can’t stand on one foot, riding a bike might be especially difficult. 2. Balance. While teaching your kid to ride a bike will help improve their balance, they also need some balance skills to begin with. 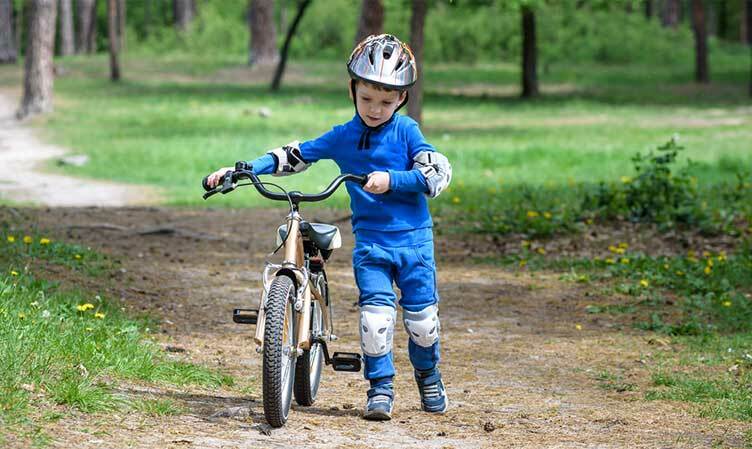 If your child can’t stand on one foot, riding a bike might be especially difficult. ​Understanding of risk. While not absolutely necessary, it’s beneficial for kids to understand when they’re in dangerous situations while learning to ride a bike. This will help keep them safe during the learning process. 3. Understanding of risk. While not absolutely necessary, it’s beneficial for kids to understand when they’re in dangerous situations while learning to ride a bike. This will help keep them safe during the learning process. ​A desire to learn. This is perhaps the most important—and most underappreciated—quality that kids need to learn to ride. If your child doesn’t want to learn, no amount of coaxing from you is going to do it. 4. A desire to learn. This is perhaps the most important—and most underappreciated—quality that kids need to learn to ride. If your child doesn’t want to learn, no amount of coaxing from you is going to do it. ​Some kids are understandably scared of learning to ride a bike. It’s a very unnatural activity. And sometimes kids just aren’t interested. Read on for a few tips on how to overcome these difficulties. Some kids are understandably scared of learning to ride a bike. It’s a very unnatural activity. And sometimes kids just aren’t interested. This is a common question from parents: “When should I teach my child to ride a bike?” While there’s no specific age, there are a few guidelines to follow. Most kids are ready to learn to ride around five years of age. ​Many kids are nervous about getting on a bike for the first time. And it makes sense—a two-wheeled vehicle that travels rather quickly and requires you to balance to prevent yourself from taking a spill is a pretty scary idea. Especially for a child. The first step in overcoming your child’s fear of riding a bike is to understand their fear. You probably don’t remember how you felt when you learned to ride. But there’s a good chance that you were scared, too. There’s nothing wrong with being anxious about learning to ride a bike. Remember that kids who are scared to learn to ride will benefit from starting especially slow. We’ll go over the specific techniques to use in teaching a child to ride in a moment. ​Remember that kids who are nervous about bike-riding need to spend extra time on the early steps. Patty Chang Anker has some great advice for overcoming children’s fear of riding, and possibly the most helpful one is to stay positive. Focus on what they’re doing right, and encourage them to keep it up. Let them know that you might raise your voice so they can hear you, not because you’re frustrated or angry. Many kids are nervous about getting on a bike for the first time. And it makes sense—a two-wheeled vehicle that travels rather quickly and requires you to balance to prevent yourself from taking a spill is a pretty scary idea. Especially for a child. The first step in overcoming your child’s fear of riding a bike is to understand their fear. You probably don’t remember how you felt when you learned to ride. But there’s a good chance that you were scared, too. There’s nothing wrong with being anxious about learning to ride a bike. So start there. Remember that kids who are scared to learn to ride will benefit from starting especially slow. We’ll go over the specific techniques to use in teaching a child to ride in a moment. When you get there, remember that kids who are nervous about bike-riding need to spend extra time on the early steps. Patty Chang Anker has some great advice for overcoming children’s fear of riding, and possibly the most helpful one is to stay positive. Focus on what they’re doing right, and encourage them to keep it up. Let them know that you might raise your voice so they can hear you, not because you’re frustrated or angry. ​This is a difficult issue, especially for parents who love cycling. Sometimes kids just aren’t interested in learning to ride a bike. And that’s okay. ​Just because riding a bike seems like something kids should want doesn’t mean your child is abnormal or has done something wrong if they don’t want to. If your kid isn’t interested, you can try—gently!—to get them interested. Tell them how much fun you have when you ride, and emphasize to them how much you’re enjoying yourself when you ride your own bike. Point out other kids having fun on their bikes. But don’t overdo it. Sometimes kids just won’t be interested. And if you try too hard to get them interested, it’ll only push them further away. While some children are riding proficiently by age four, others won’t be interested enough to learn until they’re seven, eight, twelve, or even later. Some kids never learn to ride a bike. ​And there’s nothing wrong with that. This is a difficult issue, especially for parents who love cycling. Sometimes kids just aren’t interested in learning to ride a bike. And that’s okay. That’s an important thing to remember. Just because riding a bike seems like something kids should want doesn’t mean your child is abnormal or has done something wrong if they don’t want to. If your kid isn’t interested, you can try—gently!—to get them interested. Tell them how much fun you have when you ride, and emphasize to them how much you’re enjoying yourself when you ride your own bike. Point out other kids having fun on their bikes. But don’t overdo it. Sometimes kids just won’t be interested. And if you try too hard to get them interested, it’ll only push them further away. While some children are riding proficiently by age four, others won’t be interested enough to learn until they’re seven, eight, twelve, or even later. Some kids never learn to ride a bike. ​Be gentle and positive about getting your child interested in riding a bike. They might not be interested right now. Don’t force it on them. Let them come to it in their own time, and they’ll be much happier when they learn. be gentle and positive about getting your child interested in riding a bike. They might not be interested right now. Don’t force it on them. Let them come to it in their own time, and they’ll be much happier when they learn. Remember: be gentle and positive about getting your child interested in riding a bike. They might not be interested right now. Don’t force it on them. Let them come to it in their own time, and they’ll be much happier when they learn. ​You might think of there only being one kind of a bike—the kind with two wheels. But your kids can actually progress through a range of bike types on their way to learning to ride a regular bike. As with anything else in this guide, be sure to take your child’s specific readiness level and physical abilities into account when choosing the type of bike for them. ​Recommended ages: 2 to 5. A balance bike is like a bike without pedals or a drivetrain. It’s basically two wheels and a seat. Kids need to use their feet to propel the bike, so their feet are always near the ground. And the balance bike is low enough that if they start to lose their balance, they can just put a foot down. Balance bikes used to be rare, but they’re now replacing trikes and bikes with training wheels. Because they don’t allow kids to develop bad habits like training wheels do, they’re the preferred method for getting kids ready to bike. While each child is different, you can expect yours to be able to use a balance bike around age two. Some kids start earlier, and some start later. Fortunately, there are plenty of adjustable models that fit kids from 20 months up to five years or so. Recommended ages: 2 to 5. A balance bike is like a bike without pedals or a drivetrain. It’s basically two wheels and a seat. 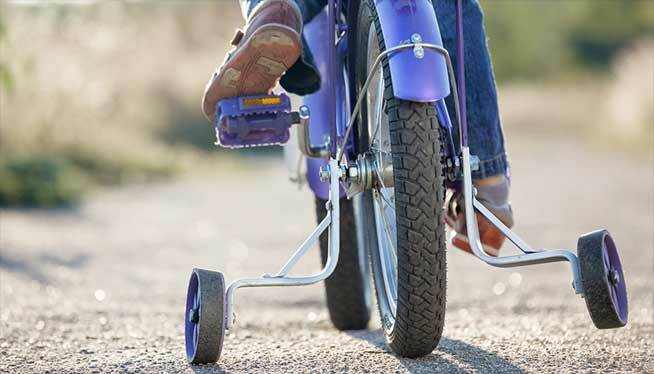 Kids need to use their feet to propel the bike, so their feet are always near the ground. And the balance bike is low enough that if they start to lose their balance, they can just put a foot down. 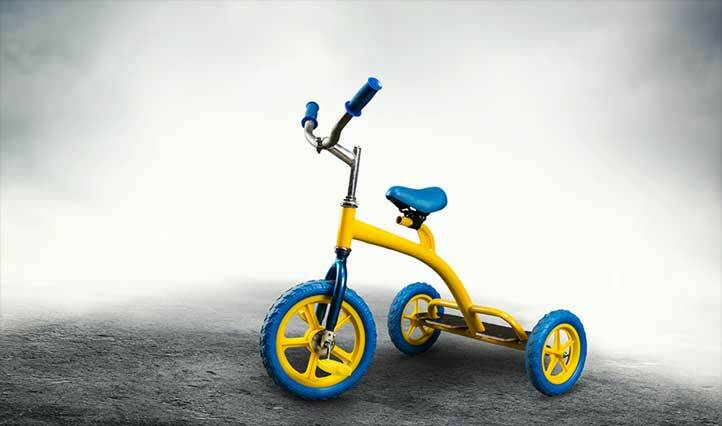 Balance bikes used to be rare, but they’re now replacing trikes and bikes with training wheels. Because they don’t allow kids to develop bad habits like training wheels do, they’re the preferred method for getting kids ready to bike.While each child is different, you can expect yours to be able to use a balance bike around age two. Some kids start earlier, and some start later. Fortunately, there are plenty of adjustable models that fit kids from 20 months up to five years or so. While balance bikes will better prepare your child for riding an actual bike, some kids really enjoy riding tricycles. There are many different kinds of trikes, from metal-framed options with pneumatic tires to fully plastic models that sit almost on the ground. Trikes are great for teaching your child to pedal and introducing them to the fun of cycling. Just remember that they won’t teach the balance skills that are required for successfully riding a regular bike. ​Though! Especially if your child enjoys it. While balance bikes will better prepare your child for riding an actual bike, some kids really enjoy riding tricycles. There are many different kinds of trikes, from metal-framed options with pneumatic tires to fully plastic models that sit almost on the ground. Trikes are great for teaching your child to pedal and introducing them to the fun of cycling. Just remember that they won’t teach the balance skills that are required for successfully riding a regular bike. This is why balance bikes are generally recommended as a better learning method. There’s nothing wrong with tricycling, though! Especially if your child enjoys it. Recommended ages: 3 to 5. ​Getting your child a bike with training wheels might seem like a good idea—it lets them learn the basics without the risk of falling over, and when they’re ready to ride without the training wheels, they already have a bike. However, ​training wheels have fallen out of fashion. They don’t teach kids the necessary skills for riding a bike, and trying to buy a bike that will fit your child in multiple stages of the learning process will likely lead to getting a bike that’s the wrong size. ​Recommended ages: 4 and up. There are plenty of small bikes designed for kids, and once your child has gotten the hang of a balance bike, they’re probably ready to take the step up. We’ll talk about how to choose the right size bike for your child in the next section. In the end, the type of bike that’s best for your child may depend on their balance skills, their readiness to learn to ride, and your budget. We recommend choosing a balance bike, because it will make for the easiest transition to riding a standard bike. 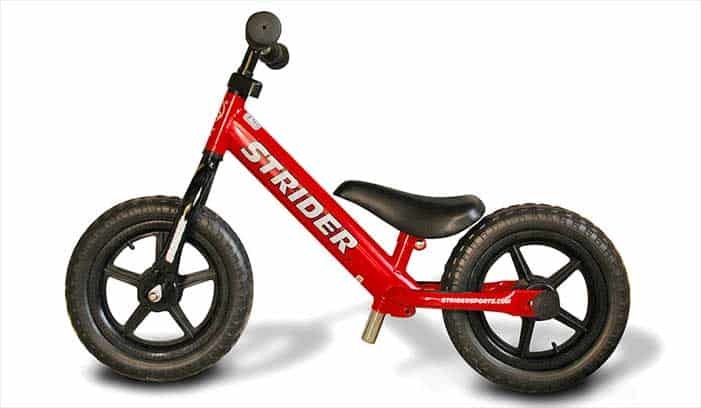 Trikes can be a lot of fun, and bikes with training wheels reduce the number of bikes you’ll need to buy. Just know that they both may hamper your child’s learning to ride a bike. 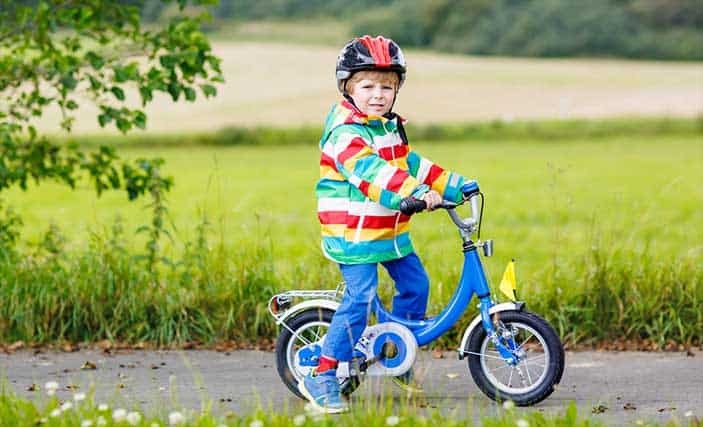 There are plenty of small bikes designed for kids, and once your child has gotten the hang of a balance bike, they’re probably ready to take the step up. We’ll talk about how to choose the right size bike for your child in the next section.In the end, the type of bike that’s best for your child may depend on their balance skills, their readiness to learn to ride, and your budget. We recommend choosing a balance bike, because it will make for the easiest transition to riding a standard bike. Trikes can be a lot of fun, and bikes with training wheels reduce the number of bikes you’ll need to buy. Just know that they both may hamper your child’s learning to ride a bike. You might think of there only being one kind of a bike—the kind with two wheels. But your kids can actually progress through a range of bike types on their way to learning to ride a regular bike. As with anything else in this guide, be sure to take your child’s specific readiness level and physical abilities into account when choosing the type of bike for them. ​Having the right type of bike can make a big difference in helping your child learn to ride. But one thing that many parents don’t give as much thought to is finding the right size bike. Above all, don’t buy a bike that’s too big for your child. You might think that they’ll grow into it and you won’t have to buy as many bikes. But a bike that’s too big makes it harder to learn. Not only that, but it could be unsafe. Buy a bike that’s the right size. It might be a bit more expensive in the long run, but your child will be safer, better able to learn, and happier. It’s a win all around. The best way to ensure a good fit for your child is to take them to a bike shop. If you don’t have experience fitting bikes, it can be difficult to pin down the right size. ​A professional will be able to help. The following are only guidelines, and won’t work for every child. On a balance bike and a first two-wheeler, your child should be able to put their feet flat on the ground. This will change once they move up to their second bike, but having a stable base is crucial at first. If kids haven’t yet learned to use a hand brake, they should always be able to put their foot flat on the ground. On a second bike, your child should only be able to touch his or her toes to the ground while on the saddle. Many people don’t know this about bike fit, but it’s really important. You shouldn’t be able to put your foot flat on the ground while you’re on the saddle. It feels weird at first, but it’s crucial. Your child should be able to stand over the bike. With his or her hands on the handlebars and feet flat on the ground, your child should be able to stand over the top tube without touching it. There should be a few inches of clearance between the bike and your child’s body. Handlebars should be a comfortable distance away and height. If the handlebars are at the right distance from your child, his or her elbows will be slightly bent. If they’re at the right height, your child’s hands will be about at the height of their waist. If the handlebars are too close or too high, your child will be in an uncomfortable and less stable position. Keeping these things in mind, you can find the right size bike for your child. Kids’ bikes are often measured in wheel size, and we’ll be giving a few recommendations for wheel sizes momentarily. But remember that bikes can have different standover heights, cockpit lengths, and other dimensions even if they have the same wheel size. This is why getting a professional to help fit your child on a bike can be such a big help. ​In the end, it’s all about fit. If a bike fits your child, it’s the right size. That might be outside these guidelines. That’s fine. Just make sure your child is comfortable and safe on his or her bike. ​There are all sorts of accessories out there for helping kids learn to ride. And you might be tempted to invest in a lot of them. But as you’ll see here, there aren’t very many of those accessories that are actually helpful. ​Your child absolutely needs a helmet. At a young age, the type of helmet doesn’t matter very much, because every new helmet that’s sold is certified to be adequately protective. Your child will fall—that’s to be expected. So make sure you’re protecting their head. A properly fit helmet will be snug, and the rim of the helmet will be about an inch from your child’s eyebrows. It won’t move much when you push on it. The chin straps will form a Y shape right under your child’s ear, and you shouldn’t be able to fit more than two fingers between the chin strap and your child’s chin. For a full guide on fitting your child’s helmet, check out Children’s Hospital of Los Angeles’ guide to fitting a helmet. You’ll find advice and images there that will help ensure your kids are safe. Your child absolutely needs a helmet. At a young age, the type of helmet doesn’t matter very much, because every new helmet that’s sold is certified to be adequately protective. Your child will fall—that’s to be expected. So make sure you’re protecting their head. ​Whether your child wears knee and elbow pads is up to you. They do provide additional protection, but they can make it a bit harder to move around. And kids scrape their knees and elbows all the time, so it probably isn’t something to worry about. Kids learning to ride bikes aren’t likely to fall very far or very hard, but a bit of extra protection can help put your mind at ease. If you do decide your child will wear these pads, make sure to get a child’s size and that they don’t restrict movement. It’s hard enough learning to ride a bike—not being able to move your arms and legs doesn’t help! Whether your child wears knee and elbow pads is up to you. They do provide additional protection, but they can make it a bit harder to move around. And kids scrape their knees and elbows all the time, so it probably isn’t something to worry about. Kids learning to ride bikes aren’t likely to fall very far or very hard, but a bit of extra protection can help put your mind at ease. ​This is, of course, the main accessory that people use when their kids are learning. But is it a good idea? People have differing opinions on this, but as we mentioned before, training wheels aren’t nearly as effective as a balance bike in easing your child into a real bike. That being said, some people do have good results with training wheels. And if you only want to buy a single bike for your child, it might be beneficial to add training wheels to it. In general, we’d recommend against it. But there are pros and cons, and you need to decide what will best suit your child. This is, of course, the main accessory that people use when their kids are learning. But is it a good idea? People have differing opinions on this, but as we mentioned before, training wheels aren’t nearly as effective as a balance bike in easing your child into a real bike. ​There are a few products on the market that give you more control over your child and their bike, and these might seem like a good idea. But we strongly caution you against using them. You might think you’re helping, but there are a few disadvantages to devices like these. Like training wheels, they won’t help your child learn to balance. They’ll learn to depend on you to save them when they start losing their balance. And if you’re not paying very close attention, you could actually unbalance them yourself. You’ll need to learn to let go sometime, and these devices make it harder. There are a few products on the market that give you more control over your child and their bike, and these might seem like a good idea. But we strongly caution you against using them. You might think you’re helping, but there are a few disadvantages to devices like these. There are all sorts of accessories out there for helping kids learn to ride. And you might be tempted to invest in a lot of them. But as you’ll see here, there aren’t very many of those accessories that are actually helpful. ​Safety is paramount when learning to ride a bike. Young kids often don’t have enough situational awareness to make sure that they’re safe—especially when they’re concentrating on riding—so you’ll have to make sure that the environment is safe for the learning process. Safety is paramount when learning to ride a bike. Young kids often don’t have enough situational awareness to make sure that they’re safe—especially when they’re concentrating on riding—so you’ll have to make sure that the environment is safe for the learning process. ​Your child needs to wear a helmet whenever they’re on a bike. Period. There’s not much more to say about this. Make sure to set a good example by wearing a helmet every time you’re on your own bike, whether you’re teaching or not. Your child needs to wear a helmet whenever they’re on a bike. Period. There’s not much more to say about this. ​Even if you live on a quiet street, it’s a good idea to find somewhere else to teach your child to ride a bike. If you have a very long driveway, that might work, and sidewalks are relatively safe. The best option, however, is to find an empty parking lot or basketball court. These provide smooth surfaces, plenty of room, and no traffic. The fewer cars, pedestrians, and other bikes around, the better. Even if you live on a quiet street, it’s a good idea to find somewhere else to teach your child to ride a bike. If you have a very long driveway, that might work, and sidewalks are relatively safe. The best option, however, is to find an empty parking lot or basketball court. ​Make sure your child’s bike is safe before you head out for teaching, too. Ensure that the tires are fully inflated (this makes riding much easier), that the brakes work, and that the seat and handlebars are fully secured and won’t move. If you just bought the bike, it’s probably a safe assumption that these things are true, but it only takes a few seconds to check everything over. On a related note, be sure you know if your child’s bike has a coaster brake (the kind that brakes when you pedal backwards). While many kids’ bikes have these brakes installed, they can make it more difficult to learn when your child is trying out his or her first two-wheeler. ​Long shoelaces and baggy pants can get caught in the chain and gears of a bike, and that can be disastrous. Make sure your child’s shoelaces are short and that they’re wearing shorts or non-baggy pants. It’s also a good idea to have them wear reflective clothing, especially if you’re teaching in twilight. Long shoelaces and baggy pants can get caught in the chain and gears of a bike, and that can be disastrous. Make sure your child’s shoelaces are short and that they’re wearing shorts or non-baggy pants. ​But it’s a good idea to give them an idea of what they should do if a car comes into the parking lot or a pedestrian comes by on the sidewalk. 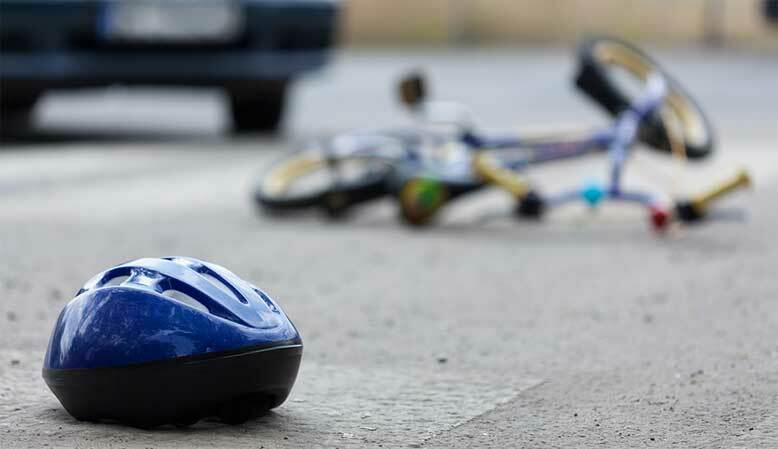 The International Bike Fund has a list of basic road-safety tenets you can teach your child. For the most part, it’s common sense. Don’t play in the road, don’t ride on busy streets, look both ways before crossing, and things like that. Once your child is confident enough to start riding on his or her own for a while, they should know all of these rules. But you can introduce them gradually throughout the learning process. You don’t need to give your child a full lecture on the right way to ride around traffic and other people on their first day, but it’s a good idea to give them an idea of what they should do if a car comes into the parking lot or a pedestrian comes by on the sidewalk. The International Bike Fund has a list of basic road-safety tenets you can teach your child. For the most part, it’s common sense. Don’t play in the road, don’t ride on busy streets, look both ways before crossing, and things like that. Once your child is confident enough to start riding on his or her own for a while, they should know all of these rules. But you can introduce them gradually throughout the learning process. ​You have the right equipment, your child is ready to learn, and you’ve found a good place to teach. It’s time for your kid to learn to ride a bike! 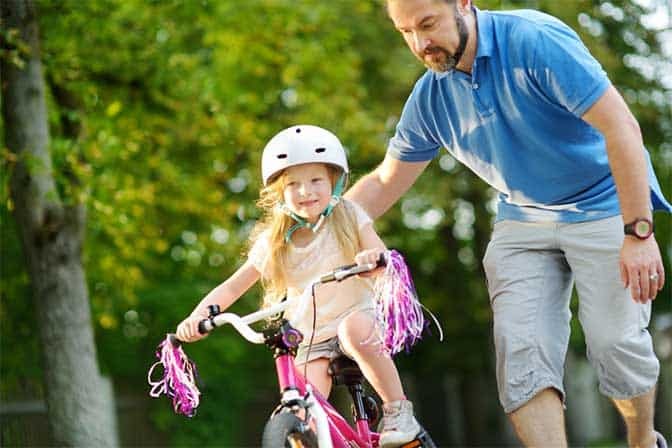 Everyone learns differently, but the following sequence of steps is a great way to introduce your son or daughter to riding a bike. You have the right equipment, your child is ready to learn, and you’ve found a good place to teach. It’s time for your kid to learn to ride a bike! Everyone learns differently, but the following sequence of steps is a great way to introduce your son or daughter to riding a bike. ​Having a bike seat at the standard height can be intimidating for a child, so lower the saddle until your child can comfortably put both of their feet flat on the ground. ​This will make pedaling a little weird, but it helps instill a sense of confidence that’s important to taking the first few steps. You may also want to remove the pedals for the next step. Removing pedals is easy with a pedal or crescent wrench. Just remember that the non-drive-side pedal threads the opposite way—turn it clockwise to take it out. Once you’ve done these two steps, you can move on. ​Even if your child has used a balance bike, it’s a good idea to get them doing the same thing on their full-size bike to help them get a feel for it. Have your child sit on the bike with both feet flat on the ground, then “scoot” the bike forward with their feet. ​After a moment of this, challenge them to pick up their feet and coast for a bit. It might only be a few seconds at first, and that’s okay. The idea is to get your son or daughter comfortable with balancing the bike on their own. Encourage them to coast further and further, eventually going up to ten or fifteen seconds. Model this action on your own bike so your child can see what you mean. When you do, hold your feet out to the side (so your legs are pointing diagonally away from you bike) so you can use them to help you balance. After a moment of this, challenge them to pick up their feet and coast for a bit. It might only be a few seconds at first, and that’s okay. The idea is to get your son or daughter comfortable with balancing the bike on their own. Encourage them to coast further and further, eventually going up to ten or fifteen seconds. Model this action on your own bike so your child can see what you mean. When you do, hold your feet out to the side (so your legs are pointing diagonally away from you bike) so you can use them to help you balance. Even if your child has used a balance bike, it’s a good idea to get them doing the same thing on their full-size bike to help them get a feel for it. ​If your child is nervous about this first step, reassure them that they won’t be going fast and that they can always put their feet down if they want to stop. Making sure this first step isn’t too scary will help your son or daughter get through the rest of the process more easily. If your child is nervous about this first step, reassure them that they won’t be going fast and that they can always put their feet down if they want to stop. Making sure this first step isn’t too scary will help your son or daughter get through the rest of the process more easily. ​Once your child feels comfortable coasting for a while, introduce the hand brakes. If the hand brakes are difficult for your child to use, have them adjusted by a bike shop to make it easier. It’s crucial that your child can effectively use the brakes. To prevent jarring stops and the reduce the potential for falling, teach your child to apply the back brake (with their right hand in the US, left hand in the UK) first. Once he or she can effectively come to a stop, you can move onto the next step. Many kids learn to ride bikes with coaster brakes, which only require that they pedal backwards to stop the bike. And in the long run, this works out fine. But pedaling backwards can help your child maintain his or her balance, so preventing it could make learning more difficult. That combined with the fact that pulling a hand brake is one of the most important things your child can do for their own safety on a bike means you should encourage use of these brakes sooner rather than later. Encourage your son or daughter to pull the rear brake gently so as to not come to a jarring halt. Once they feel comfortable with that, you can introduce the front brake, but only if you feel your child is ready. ​Challenge your child to make very gentle turns while coasting. A very slight lean is all they need—just enough to get the bike into a lazy curve. Their feet should still be close to the ground while they’re coasting, so even if they lose their balance, they can put a foot down to prevent a fall. It’s difficult to teach the required degree of lean for turning a bike. Your best bet is to show your child how you do it a few times, and then let him or her give it a shot. ​Many kids are good at figuring out the subtle changes required for making a gentle turn, but others might take a while. ​Don’t spend too much time on this; there’s plenty of time to learn the specifics of turning a bike later. But introducing this idea early on can help your child learn to recover from momentary lapses in balance and avoid obstacles, both of which will help the learning process. Once your child has gotten to this stage, you can put the pedals back on the bike (but leave the seat lowered). Don’t spend too much time on this; there’s plenty of time to learn the specifics of turning a bike later. But introducing this idea early on can help your child learn to recover from momentary lapses in balance and avoid obstacles, both of which will help the learning process. Challenge your child to make very gentle turns while coasting. A very slight lean is all they need—just enough to get the bike into a lazy curve. Their feet should still be close to the ground while they’re coasting, so even if they lose their balance, they can put a foot down to prevent a fall. It’s difficult to teach the required degree of lean for turning a bike. Your best bet is to show your child how you do it a few times, and then let him or her give it a shot. Many kids are good at figuring out the subtle changes required for making a gentle turn, but others might take a while. ​Stand next to your child while he or she sits on the saddle with both feet on the ground. Stabilize your child while they put one foot on a pedal, just to get the feeling of where the pedal is. Then, making sure they don’t fall over, tell your son or daughter to put both feet on the pedals. You may want to practice this a few times so they start to develop the muscle memory needed for finding the pedals. Once they seem comfortable with having their foot on the pedal, encourage them to perform one pedal stroke and then coast with their feet off the pedals again. ​This will help them get used to the feeling of propelling themselves with the pedals. Even a single pedal stroke can be enough to get more familiar with it. Again, this is a good thing to model. Pushing one pedal and then taking a foot off to coast actually requires a number of well-coordinated actions, and it can be difficult to explain. Show your child how to use one pedal stroke to get going, and then coast for a while. ​Remember that this is a scary step, and that some kids might have a difficult time with it. Be patient, and keep in mind that this is a very unnatural activity you’re teaching. Some kids may need to take a break here and come back later or even a couple days later. Learning to coast, brake, and turn takes a lot of mental effort, and it’s a big accomplishment! If your child starts getting frustrated or especially scared, it’s time to take a break. After your child can complete one pedal stroke before coasting for a while, introduce the second pedal. Encourage your child to make two pedal strokes before coasting. ​This requires a bit more balance, and your son or daughter might find it more difficult. Once your child is comfortable with two pedal strokes before coasting, add a few more pedal strokes until they’re riding a handful of yards at a time. At this point, they’re riding their bike! You can run along with your child to reassure them that you’re helping, but don’t be too heavy-handed. Remember that this is a scary step, and that some kids might have a difficult time with it. Be patient, and keep in mind that this is a very unnatural activity you’re teaching. Some kids may need to take a break here and come back later or even a couple days later. Learning to coast, brake, and turn takes a lot of mental effort, and it’s a big accomplishment! If your child starts getting frustrated or especially scared, it’s time to take a break. After your child can complete one pedal stroke before coasting for a while, introduce the second pedal. Encourage your child to make two pedal strokes before coasting. This requires a bit more balance, and your son or daughter might find it more difficult. Again, be patient. Once your child is comfortable with two pedal strokes before coasting, add a few more pedal strokes until they’re riding a handful of yards at a time. At this point, they’re riding their bike! Once they seem comfortable with having their foot on the pedal, encourage them to perform one pedal stroke and then coast with their feet off the pedals again. This will help them get used to the feeling of propelling themselves with the pedals. Even a single pedal stroke can be enough to get more familiar with it. Again, this is a good thing to model. Pushing one pedal and then taking a foot off to coast actually requires a number of well-coordinated actions, and it can be difficult to explain. Show your child how to use one pedal stroke to get going, and then coast for a while. ​Once your child is comfortable with using the pedals and completing a few pedal strokes at a time, you can start to progress. After a while, raise the saddle. You’ll have to gauge whether your child is ready for it to be raised to the proper height (where they can only touch their toes to the ground while seated), and you can inch it up a bit at a time to make the transition easier. Most kids will just take off from here. They’ll be capable riders in no time. However, if you want to continue being involved in the learning process, make a game out of it! Play Follow the Leader and have your child emulate your actions. ​Practice turns, slowing, stopping, and coasting. Accelerating after slowing down is a good skill to learn, as is stopping quickly without falling over. You can also help your son or daughter develop balance skills by having a “slow race” in which the first person to put their feet on the ground loses. Activities like this help kids learn the unconscious motor skills they need to successfully ride a bike. Eventually, you’ll want to teach your child safety skills, like how to look over their shoulder without veering, riding with one hand, and so on. You might want to take them on a trail ride or try out a bike park. All of this will come—but that’s best left for another day after your child has fallen in love with the awesome activity that is cycling. You can also help your son or daughter develop balance skills by having a “slow race” in which the first person to put their feet on the ground loses. Activities like this help kids learn the unconscious motor skills they need to successfully ride a bike. Eventually, you’ll want to teach your child safety skills, like how to look over their shoulder without veering, riding with one hand, and so on. You might want to take them on a trail ride or try out a bike park. All of this will come—but that’s best left for another day after your child has fallen in love with the awesome activity that is cycling. ​let’s talk about what you shouldn’t do. ​It’s easy to make mistakes when teaching someone to ride—especially if you’ve been riding a bike for a long time. Long-time riders don’t remember how difficult it is or what was helpful and harmful in their own learning process. Now that you know what you should do when you’re teaching your child to ride, let’s talk about what you shouldn’t do. It’s easy to make mistakes when teaching someone to ride—especially if you’ve been riding a bike for a long time. Long-time riders don’t remember how difficult it is or what was helpful and harmful in their own learning process. ​This is absolutely crucial, especially if your child is scared or less enthusiastic about learning to ride a bike. Celebrate even the smallest successes by praising your child and telling them how well they’re doing. Even when you’re trying to correct a mistake, focus on what your child is doing right, instead of pointing out what they’re doing wrong. This is something to keep in mind throughout the entire learning process. Yelling, showing frustration, or exhibiting any other negative feelings is going to associate negativity with bike riding in your child’s mind. And that’s not good for anyone. This is absolutely crucial, especially if your child is scared or less enthusiastic about learning to ride a bike. Celebrate even the smallest successes by praising your child and telling them how well they’re doing. ​Some kids take a while to learn to ride their bikes. Others pick it up in a few minutes. No matter how long you’ve been riding, and no matter how good of a teacher you are, your child might need several tries before they can progress to the next step in the process. It’s not their fault, it’s not your fault, it’s just how learning goes. Don’t have expectations ahead of time, and don’t show to your child that you’re disappointed or impatient. Again, make sure that the entire process is a positive one. It’s easy to get frustrated when you’re teaching someone how to do something that comes naturally to you. But remember that you’ve had years—maybe decades—to perfect your bike-riding skills. Teaching a child, especially one that hasn’t completely gotten control over their body yet, that kind of skill is bound to take some time. Don’t have expectations ahead of time, and don’t show to your child that you’re disappointed or impatient. Again, make sure that the entire process is a positive one. It’s easy to get frustrated when you’re teaching someone how to do something that comes naturally to you. But remember that you’ve had years—maybe decades—to perfect your bike-riding skills. Teaching a child, especially one that hasn’t completely gotten control over their body yet, that kind of skill is bound to take some time. ​Many parents want to be right next to their kids the entire time they’re learning to ride their bike. They stabilize their kids with their hands, walk alongside holding the handlebars, and so on. ​How do you think they’re going to feel when you let go? Of course, there are many points in the learning process where your child might be more comfortable with you nearby. You don’t need to be at a distance the whole time. Just remember that being too close can be detrimental. Figuring out exactly when you should be close and when you should be hands-off is going to come down to your child and what they need throughout the process. Fortunately, no one knows your child better than you! Stay tuned into what’s going to help them learn. Many parents want to be right next to their kids the entire time they’re learning to ride their bike. They stabilize their kids with their hands, walk alongside holding the handlebars, and so on. But this can be counter-productive. If your child gets comfortable with you stabilizing them, how do you think they’re going to feel when you let go? Of course, there are many points in the learning process where your child might be more comfortable with you nearby. You don’t need to be at a distance the whole time. Just remember that being too close can be detrimental. Figuring out exactly when you should be close and when you should be hands-off is going to come down to your child and what they need throughout the process. ​This is true throughout the entire process. ​Don’t pressure your child to learn to ride if they don’t want to. Don’t pressure your child to learn to ride if they don’t want to. ​Don’t pressure them to progress through the process faster than they’re able. Don’t pressure them to progress through the process faster than they’re able. ​Don’t pressure them to go on family rides once they’re more comfortable. Don’t pressure them to go on family rides once they’re more comfortable. ​​Just like with staying positive, removing pressure from the process will help your child make positive associations with cycling. And that’s what we’re trying to do here, isn’t it? Pressuring your child can happen unconsciously. If you’re a mountain biker, you might try to push them into trying trails early on. If you like longer-distance rides, you might want your kids to join you on one of them. And that’s fine—just remember that your son or daughter needs to move at his or her own pace. Learning to ride a bike is as much about self-sufficiency and confidence as it is about motor skills. This is true throughout the entire process. Don’t pressure your child to learn to ride if they don’t want to. Don’t pressure them to progress through the process faster than they’re able. Don’t pressure them to go on family rides once they’re more comfortable. Just like with staying positive, removing pressure from the process will help your child make positive associations with cycling. And that’s what we’re trying to do here, isn’t it? Pressuring your child can happen unconsciously. If you’re a mountain biker, you might try to push them into trying trails early on. If you like longer-distance rides, you might want your kids to join you on one of them. And that’s fine—just remember that your son or daughter needs to move at his or her own pace. ​Your child is going to fall when he or she is learning to ride a bike. It might not happen in the first few minutes, or even the first day, but it’s going to happen. And if you’re afraid of that happening, they will be too. Let them know that they’ll probably fall at some point, but that everyone does and then they get back up and try again. Some people even suggest having your child fall on purpose once before you get started teaching. In the grass, of course, and not at speed—we aren’t trying to cause trauma here. Falling off of a bike generally doesn’t hurt much, especially for kids. And once they see that, they’ll be much less afraid of it. While teaching your child to ride a bike in the grass is an option, the increased drag can make it more difficult. Some stronger kids might not find it to be a challenge, but others will be better suited by pavement or concrete. Again, do what you think will be best for your child. ​The basics of teaching a child to ride a bike, above, are relatively simple. But there are also a few tricks you can use to improve the process. Not all of these will work for everyone, but they can be a big help, especially if your child is nervous. ​It might not sound like much, but make sure to smile! The more positive energy you have, the better the learning process will go. You want your child to be excited about riding a bike and proud of his or her accomplishments when they succeed. ​When learning to balance, many people will instinctively look down at the ground. And in many cases, this is fine. But it’s not helpful when learning to ride a bike. Instead, encourage your child to look where they want to go. One way to help with this is to set a target on the ground for your child to get to or run over. REI actually suggests putting a cracker on the ground and having your child run over it to help them learn to ride straight and steer. And what child doesn’t love running over things with their bike? The Follow-the-Leader game we recommended earlier is another good way to encourage looking ahead. Your child can’t follow you if they don’t know where you are and where you’re going. ​This won’t help everyone, but some people find it useful. Whenever you’re teaching your child a new step in the learning process, model the behavior on your own bike. Whether it’s coasting with your feet out to the side, braking, or pushing one pedal, show your son or daughter how to do it instead of simply explaining it. Some concepts are difficult to show, but having some sort of visual representation to model after can help kids learn. Again, it depends on your child and how they learn best. ​A trailer bike attaches to the back of your bike. It lets your child get the feeling of balancing on two wheels without actually having to balance, and it helps them learn what pedaling feels like. Some people argue that trailer bikes are great for learning, while others find that they don’t help much. But if you want to go on longer rides with your kids, this is a great way to do it. They can help by pedaling, or rest by coasting, and spend time with the family on a bike trip. It certainly won’t make learning any more difficult, but it might not help as much as you hope. Either way, though, it’s a great way to take smaller children on longer bike rides. ​Now that you know how to choose a bike that fits, the accessories you need, how to teach your child the basics of bike-riding, and what not to do while you’re at it, you’re fully prepared to teach your kids how to ride a bike. Like most things, the biggest obstacle in your way isn’t not knowing what to do—it’s getting started! So get out there and start teaching (if your child is interested, of course). Keep the tips above in mind and remember, above all, to have fun. Bike riding is a really fun activity, and making it fun from the beginning will help get your kids interested in it right away. And there’s a lifetime of great exercise, fun, and adventure to be had from there! Now that you know how to choose a bike that fits, the accessories you need, how to teach your child the basics of bike-riding, and what not to do while you’re at it, you’re fully prepared to teach your kids how to ride a bike. Like most things, the biggest obstacle in your way isn’t not knowing what to do—it’s getting started! So get out there and start teaching (if your child is interested, of course). Keep the tips above in mind and remember, above all, to have fun. Bike riding is a really fun activity, and making it fun from the beginning will help get your kids interested in it right away. A trailer bike attaches to the back of your bike. It lets your child get the feeling of balancing on two wheels without actually having to balance, and it helps them learn what pedaling feels like. Some people argue that trailer bikes are great for learning, while others find that they don’t help much. But if you want to go on longer rides with your kids, this is a great way to do it. They can help by pedaling, or rest by coasting, and spend time with the family on a bike trip. It certainly won’t make learning any more difficult, but it might not help as much as you hope. This won’t help everyone, but some people find it useful. Whenever you’re teaching your child a new step in the learning process, model the behavior on your own bike. Whether it’s coasting with your feet out to the side, braking, or pushing one pedal, show your son or daughter how to do it instead of simply explaining it. It might not sound like much, but make sure to smile! The more positive energy you have, the better the learning process will go. You want your child to be excited about riding a bike and proud of his or her accomplishments when they succeed. The basics of teaching a child to ride a bike, above, are relatively simple. But there are also a few tricks you can use to improve the process. Not all of these will work for everyone, but they can be a big help, especially if your child is nervous. Your child is going to fall when he or she is learning to ride a bike. It might not happen in the first few minutes, or even the first day, but it’s going to happen. And if you’re afraid of that happening, they will be too. Some people even suggest having your child fall on purpose once before you get started teaching. In the grass, of course, and not at speed—we aren’t trying to cause trauma here. Falling off of a bike generally doesn’t hurt much, especially for kids. And once they see that, they’ll be much less afraid of it. While teaching your child to ride a bike in the grass is an option, the increased drag can make it more difficult. Some stronger kids might not find it to be a challenge, but others will be better suited by pavement or concrete. Again, do what you think will be best for your child. Having a bike seat at the standard height can be intimidating for a child, so lower the saddle until your child can comfortably put both of their feet flat on the ground. This will make pedaling a little weird, but it helps instill a sense of confidence that’s important to taking the first few steps. You may also want to remove the pedals for the next step. Removing pedals is easy with a pedal or crescent wrench. Just remember that the non-drive-side pedal threads the opposite way—turn it clockwise to take it out. Make sure your child’s bike is safe before you head out for teaching, too. Ensure that the tires are fully inflated (this makes riding much easier), that the brakes work, and that the seat and handlebars are fully secured and won’t move. If you just bought the bike, it’s probably a safe assumption that these things are true, but it only takes a few seconds to check everything over. Don’t skip it! On a related note, be sure you know if your child’s bike has a coaster brake (the kind that brakes when you pedal backwards). While many kids’ bikes have these brakes installed, they can make it more difficult to learn when your child is trying out his or her first two-wheeler. In the end, it’s all about fit. If a bike fits your child, it’s the right size. That might be outside these guidelines. That’s fine. Just make sure your child is comfortable and safe on his or her bike. Having the right type of bike can make a big difference in helping your child learn to ride. But one thing that many parents don’t give as much thought to is finding the right size bike. Above all, don’t buy a bike that’s too big for your child. You might think that they’ll grow into it and you won’t have to buy as many bikes. And that’s true. But a bike that’s too big makes it harder to learn. Not only that, but it could be unsafe. Buy a bike that’s the right size. It might be a bit more expensive in the long run, but your child will be safer, better able to learn, and happier. It’s a win all around. The best way to ensure a good fit for your child is to take them to a bike shop. If you don’t have experience fitting bikes, it can be difficult to pin down the right size. A professional will be able to help. The following are only guidelines, and won’t work for every child. On a balance bike and a first two-wheeler, your child should be able to put their feet flat on the ground. This will change once they move up to their second bike, but having a stable base is crucial at first. If kids haven’t yet learned to use a hand brake, they should always be able to put their foot flat on the ground. On a second bike, your child should only be able to touch his or her toes to the ground while on the saddle. Many people don’t know this about bike fit, but it’s really important. You shouldn’t be able to put your foot flat on the ground while you’re on the saddle. It feels weird at first, but it’s crucial. Your child should be able to stand over the bike. With his or her hands on the handlebars and feet flat on the ground, your child should be able to stand over the top tube without touching it. There should be a few inches of clearance between the bike and your child’s body. Handlebars should be a comfortable distance away and height. If the handlebars are at the right distance from your child, his or her elbows will be slightly bent. If they’re at the right height, your child’s hands will be about at the height of their waist. If the handlebars are too close or too high, your child will be in an uncomfortable and less stable position. Keeping these things in mind, you can find the right size bike for your child. Kids’ bikes are often measured in wheel size, and we’ll be giving a few recommendations for wheel sizes momentarily. But remember that bikes can have different standover heights, cockpit lengths, and other dimensions even if they have the same wheel size. This is why getting a professional to help fit your child on a bike can be such a big help.